Geo TV: The only all-female coding school in Afghanistan is aiming to bridge gender gaps in a society which considers tough work like programming men’s expertise. Code to Inspire is the first ever only female coding school in Afghanistan. Established in Herat in the year 2015 the school now looks to expand in Mazar-e Sharif. 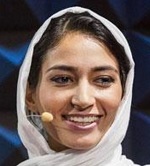 Its founder and CEO Fereshteh Forough hails from a refugee family that has moved to Iran after the Taliban took control of Afghanistan in 1996. Fareshteh and her family returned once the Taliban regime has been overthrown. She received her bachelor’s degree in computer science from Herat University and a Master’s degree from Technical University of Berlin in Germany. Click here to read more (external link).